We are thrilled to be today's stop on The Vaempires: Zombie Rising Bloody Chunks Tour hosted by Dark Mind Book Tours. We are fans of Thomas Winship's Vaempires series and this tour is to get the word out on his third book in the series by sharing parts of the chapters. Isn't that a great idea? We now hand over our blog to Mr. Winship. Hello everyone. Welcome to the Bloody Chunks Tour! I’m Thomas Winship, author of Vaempires: The Evolutionary War—a vampire series that explores the question: what if vampires evolved? For this book tour, I decided to do something a bit different. Instead of sharing excerpts, reviews, interviews, and all the usual accompaniments, I’m giving you the book itself—piece by piece. Or chunk by bloody chunk! This tour is the only place where you can read Vaempires: Zombie Rising, the next chapter in the vaempires saga, before its official release! 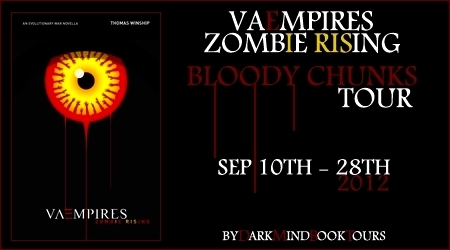 The tale of The Evolutionary War resumes in Væmpires: Zombie Rising. Væmpires have taken control of twelve major cities. Their leader, Vielyn, seeks the atomic weapons that will bring the rest of the world to its knees. Vampire forces are reeling. As Linq and Ray race to the royal estate to rendezvous with Cassandra and Daniel, the princess is captured and Daniel falls. With the fate of world shifting to their teenage shoulders, Linq and Ray must deal with tremendous losses while battling a most unexpected—and undeadly—new foe. This tour wouldn’t be possible without the time and efforts of a very special group of people, beginning with Silvia and Franny at Dark Mind Book Tours and including everyone on the list below. Please show your support by stopping by, commenting, and spreading the word! September 19th: Reader Girls / Chapter 6, Part 1 TODAY! I hope you enjoy Vaempires: Zombie Rising! Ray won the race. With his head start, it wasn’t even close, but the truth was that Linq could never beat Ray in a fair race. Ray was built for speed, whereas Linq was built for strength. Luckily, it was strength of body and mind. Nevertheless, he was hot on Ray’s heels as they reached the palace’s formal entrance. Guards weren’t at their customary places alongside the yawning doorway, which felt odd, but not nearly as odd as gaining access to the palace without undergoing a security scan. They entered the security suite. The enormous area—normally a beehive of activity, with hordes of people moving through the various stages of clearance while palace personnel buzzed about on officious duties and the din from dozens of conversations drowned out the hum of machines—was made even bigger by the total absence of life. It wasn’t empty, by any means, just empty of people. It looked like a hurricane had swept through. Workstations were toppled. Vidscreens were scattered across the floor. Paper was everywhere. And it was silent. All the equipment was dead. It shouldn’t have been, since the estate had emergency power services with multiple backup systems, but it was. They moved through the suite at a hurried pace. Linq expected an ambush at any moment. Although his senses claimed they were alone, he realized that his senses would be less than trustworthy while in the palace’s east ward. As a concession to human dignitaries—the paranoid ones, in particular—the guest quarters were rife with mechanisms designed to dampen heightened senses. Not quite down to human levels, but a significant decrease, nevertheless. Daniel’s father—Steven DeStrey, Captain of the Royal Guard—had always railed against the use of dampers to “level the playing field,” as proponents put it. “That’s because humans have no strengths,” someone would quip. In mixed company, Steven would hold his tongue. But in front of his troops, men and women who knew how much he cared about fulfilling his royal duties, he would respond. And it was always the same response. “It wasn’t humans we should’ve been worried about,” Linq said. His bitter voice rang overloud in the room despite the dampers, bringing Ray to a halt. The slender teen spun on his heels, blue eyes wide. “What?” he whispered, managing to make the word a question and an admonishment. “Nothing,” Linq muttered, shaking his head as he drew abreast of his blond friend. Ray studied his face as he continued past but didn’t say anything else. Linq moved a few steps ahead before Ray hurried to catch up. The teens pushed on in lockstep, looking up, down, and all around, straining ears and noses and other senses to detect a hint of anything that might alert them to trouble, or at least other signs of life, as they exited the security suite. 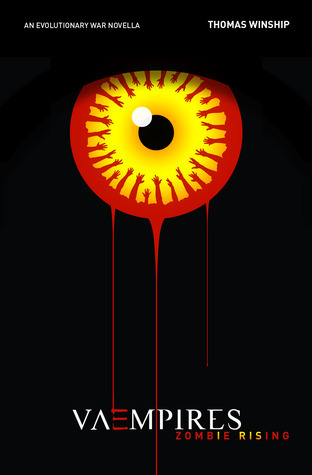 Their senses detected only death and destruction. A part of Linq yearned to refocus, to start a room-by-room search for survivors, in the hopes of locating his parents. He knew it was selfish and he realized that his duty was to help ensure the safety of Daniel and Cassandra—the acting king and soon-to-be queen—but he couldn’t help it. If his parents were alive, they needed him, too. As if in response to his thoughts, Linq’s wrist tingled. When in silent mode, the wristband delivered a small electric shock to signal an incoming call, just enough to keep lines of communication open in even the most discreet circumstances. Excited, he tapped the vidscreen. The call wasn’t from his parents, so he ignored it. Even if it hadn’t been poor timing, he was in no mood to assuage someone else’s concerns. A sense of urgency propelled him forward like an insistent hand pressing against his back. The teens were nearly soundless, but even the slightest whispers of movement echoed down the lifeless corridors. Linq felt surrounded by something he couldn’t identify. It emanated from the walls and permeated the air, an energy of some type that, while not quite malevolent, was dark and unpleasant. It said that something had occurred here. Something inconceivable yet unavoidable. Something irrevocable. The royal palace had never felt haunted before, although many artists as well as some scholars and scientists claimed the walls hummed with residual energy. They argued that any construct with such a long and storied past, especially one that predated the Great Devastation, was more living than inanimate, and that one day the technology to prove it would exist. Windsor Castle had a dark past. Of course, as a palatial jewel in the British crown, it had been resplendent in the glory of British history; but when the beautiful veneer was stripped away by the passage of time, the cold reality was that its history was a history bathed in as much blood as any other monarchy. The teens approached the castle proper. Just as it had been in Orion, the signs of the væmpire assault were everywhere. Claw marks scarred the walls and furniture. Art was broken and ripped and burned. The wanton damage was indiscriminate and unnecessary—a sure sign of a rampaging horde drunk with victory. What wasn’t evident were blaster holes or laser burns. The væmpire force had either been unarmed or hadn’t needed anything but the element of surprise and their natural weapons of fangs and claws. And, of course, vampire royal guards hadn’t carried weapons; the argument had always been that they were formidable enough as it was. Many things that were once believed true were now dead. It was a grim realization. Ray and Linq moved down a corridor that was even more damaged than earlier ones. While most doors they’d encountered had been torn from their hinges, the doors lining the current corridor had been attacked as if guilty of some grave offense. Someone had battered them until they were broken into pieces; pieces that were then scattered up and down the hall. It was impossible to traverse the corridor without stepping on the detritus. Linq winced at the sudden cacophony of splintering wood. “Jesus,” he hissed between clenched teeth. “Just be thankful we’re not barefoot,” Ray quipped, but his voice rang hollow. The carnage made sense once they came to the end of the corridor, where they entered a small sitting room boasting a fireplace. Most fireplaces in existence were ornamental, as burning wood was strictly regulated because of lingering atmospheric conditions from the Great Devastation; but the palace boasted a handful of functional ones—the only ones in all of Orion, in fact. Vampires never used the fireplaces, but human visitors sometimes took advantage of the opportunity. The large room was furnished with black leather sofas and chairs. Some were arranged in small circles to facilitate conversation. Some were situated in pairs or trios away from any main groups. A half-dozen chairs and a long sofa were spread out in a line facing the fireplace. Wood was strewn about the room in haphazard piles. The fireplace was stuffed with broken and splintered door pieces. Nothing was ablaze, but the fireplace had been used recently. Someone visiting for Cassandra’s party must have lit a small fire, a fire that was choked out when the rampaging væmpires had stuffed too much wood in it. Something glinted in the fireplace’s dark folds. By unspoken agreement, the teens stepped over to the opening. As Ray leaned down to extract the item from the ashes, Linq had a vision of things swarming out of the chimney to attack the blond teen—dark, amorphous, dead things that flowed out in an oily wave, covering Ray first before flooding out to coat everything in the room in inky blackness. He almost cried out for Ray to stop, but he bit his tongue. Their enemy wasn’t some unnamed, imaginary creature. It was flesh and blood. “They were part of us,” he muttered. “Huh?” Ray said, straightening up and holding a dirty object in his hand. Linq didn’t respond. What would he say? I’m starting to crack from the pressure? I can’t believe our own people did this to us? What would it help? Both he and Ray knew people—good people—who had mutated into væmpires. No family members—thank God (and he felt guilty for thinking that)—not even anyone they were especially close to. What about Vielyn? an inner voice piped up. What about him? Linq silently responded with disgust. What Vielyn had done was so utterly disgusting, so big a betrayal, that he had proven any closeness any of them had thought existed had been a lie. Linq didn’t know. Donrel had always been a voice of reason. But then he had shown up, uninvited, to the secret summit, ruining everything King Brant had been working toward. Ray rubbed ashes and soot from the object, bringing it into view. He turned it from left to right. From the right side, it was unrecognizable. One side was a misshapen lump; the other, but for ashes and some scratches near the bottom, was unmarked. It was a bust of Arold, the first vampire king. It typically sat in the entrance way. “Well, we know what they used to beat down the doors,” Ray said with a wry smile. He sobered when he saw that the scratches near the bottom were actually teeth marks right where the carotid artery would be. A disgusted look crossed the blond teen’s face. He went to toss the bust aside, but thought better of it. He glanced around, and then settled for placing it on the cushion of a sofa. Emboldened, both teens took off at a rapid clip. They slid through corridors and passageways, sidestepping debris and leaping over anything they couldn’t go around. On one occasion, Ray displayed prodigious strength that belied his slender form by tossing a massive bronze statue aside with one hand. The statue had been a centerpiece of the east ward. The teens had slowed upon reaching it, but they hadn’t stopped or turned around. There was nothing behind them, while their friends and the rest of their lives were before them. Finally, they burst out into the courtyard of the east ward, their heightened senses returning as they moved beyond the reach of the dampeners. Linq didn’t dare look up at the sun shining overhead. Although synth-blood prevented it from warming his skin, he felt its weight lying on him. It felt good. Clean. It dispelled some of the darkness clouding his soul. But it was too bright at the moment. Insects buzzed and droned in the distance. Linq didn’t detect any heat signatures nearby. They felt, for all intents and purposes, alone. Thomas Winship was born in Middletown, NY and still resides in Orange County. He holds an MBA in Management from St. Thomas Aquinas College, where he serves as an adjunct professor of courses in English Composition, Communications, and Business. He also spent fifteen years working for a global pharmaceutical company, specializing in organizational development, talent management, and training. Tom writes in his spare time. His first novel, a mystery/legal thriller entitled Temporary Insanity (a.k.a. Case Closed), was a 2008 finalist in a national contest but failed to garner industry attention. His second novel, Væmpires: Revolution, was published in October and a follow-up novella, Væmpires: White Christmas, was published in December. He is an avid collector of books, comic books, music, and movies. His interests are diverse: on any given day, Tom is likely to be found watching a horror movie, attending a hard rock concert, or enjoying a Broadway show. Follow the tour to keep reading the book! Laurie, Caitlin, and Meg--Thank you for having me back and for helping share Vaempires: Zombie Rising! Always a pleasure to share our blog with your Vaempires and zombies! I really enjoyed reading the excerpt. I like the gloomy and dark atmosphere.